My family have not bought barbecued pork (bak kwa) for many years for Lunar New Year. My mum only buys it during off-peak periods. It makes no economic sense to buy at high prices during peak demand in the run-up to Lunar New Year. Is the same for reunion dinners which more & more people are eating outside. Restaurant workers are in short supply during the festive days. Insufficient workers coping with high demand = questionable hygiene & cooking process. 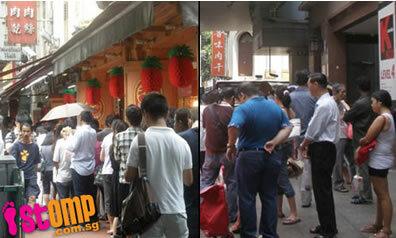 You can buy the bak kwa ahead of the chinese new year before the price goes up. I always do that and put them in the freezer, reheat them during CNY and it will last for days. Those that are bought during the CNY rush are actually made in the same way but stored in the factory freezers and reheated before sending to the outlets. Nowadays the outlets do not barbecue the meat or most of them do not. By the I still prefer to call it Chinese New Year instead of Lunar New Year. Think the gov calls it LNY since there are too many non=Chinese foreigners here and change it to LNY instead of CNY which was referred as previously. Thanks for comment. Saw it today as didn't blog for past few days. If Bak Kwa from JB are allowed, there would be hordes of buyers going over to buy & bring back. As for whether is LNY or CNY, i'm not aware of the change of addressing it by the Pro Alien Party. I like CNY a lot during kid days. Nowadays is becoming more of a dread in this divided society like S'pore. People not heard of (not even a sms) during the year only shows up during CNY. And oh this year my relatives from Msia(johor) came to visit. Is been more than a decade. I suspect they came because my mum was hospitalised in Dec. Old folks come visiting old folks cause a 'sudden departure' might happen (touch wood).